Stress comes in many forms. Acute stress is the type of stress that happens and is then over quickly, leaving relatively little damage in its wake. Chronic stress, on the other hand, is the type of stress that occurs on a more regular basis and creates far more damage in the body, including everything from greater susceptibility to colds and the flu to a higher risk of heart disease. In contrast, there is even a beneficial type of stress called eustress, which is a positive form of stress for most people unless it becomes too intense or chronic—this is the type of stress that comes from an exciting vacation or engaging challenge. Too much of any type of stress, however, can feel overwhelming, and it can often sneak up on us. Many people don't realize how much stress is building up until they suddenly feel overwhelmed. Other times, stressful or attention-demanding events may seem to happen one after the other, and you may go from feeling calm to completely overwhelmed with surprising speed. However it happens, it is important to have strategies for coping when you feel overwhelmed by stress and need to quickly relax your mind and body. 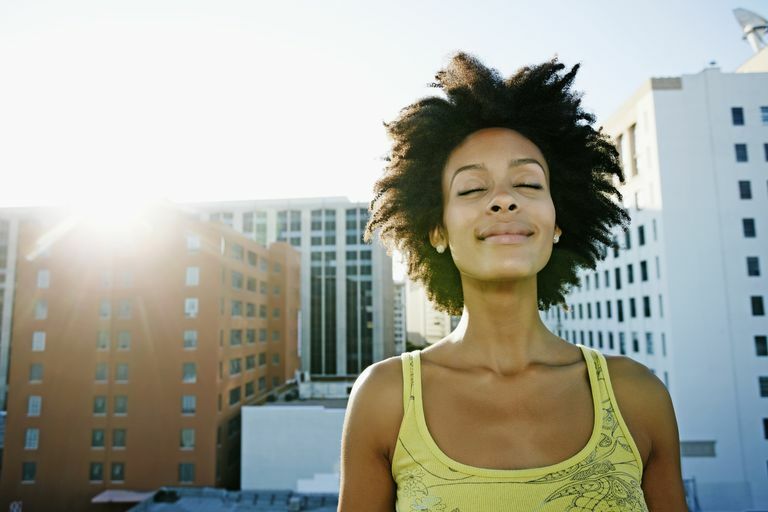 The following are five quick and easy ways to regain your calm so you can deal with whatever situations are at hand. Exercise can be a great stress reliever in itself, as it helps you blow off steam and releases endorphins. Taking a walk when stressed can bring you the benefits of exercise — both short-term and long-term, and it provides the bonus of getting you out of the stressful situation. This can provide you with some perspective so you can return in a new frame of mind. Walking with a good friend can be a nice way to find social support, and walking alone can provide you with some time to think, reframe, and return with a more optimistic frame of mind. If you're not in a position to leave, you can feel better right away by practicing breathing exercises. Getting more oxygen into your body and releasing physical tension are two ways that breathing exercises can benefit you, and you can do them anytime or anywhere, even if your demanding situation isn't letting up. If you can steal away a few minutes of peace, visualizations and guided imagery are a wonderful way to restore peace of mind. They're easy to do and can relax you physically as well as mentally. With practice, you can easily access your "happy place" and quickly feel calmer when stressed. Sometimes we intensify our experience of stressful situations by the way we look at them. If you can look at your situation differently, you may be able to put it into a different perspective — one that causes you less stress! Read more about mental and emotional stress that can be caused by pessimism, type A traits, and other self-sabotaging thought patterns, and learn how you can change the way you look at things. It'll come in handy when you're stressed. Progressive muscle relaxation (PMR) is a technique where you tense and release all of your muscle groups, leaving your body to feel more relaxed afterward. PMR is one of my favorite techniques, as it can be done by just about anyone, and with practice, you can fully release virtually all the tension you're feeling in your body in a matter of seconds! This can help you feel calmer and better able to handle the situations at hand.